Like every RST-B type, PPX / PHX rotary indexing tables utilize the well-proven ServoPress ball coupling. Two collars of precision steel balls interlock into one another like a toothed wheel rim. This ensures a high degree of precision under a heavy load. The basic PPX / PHX designs are pneumatically driven. An absorbing system that comes into play during elevation allows the appliance to operate in an elegant and gentle manner. Like the air maintenance unit, the control valve must be connected to the PPX / PHX in series and is of course positively controlled. 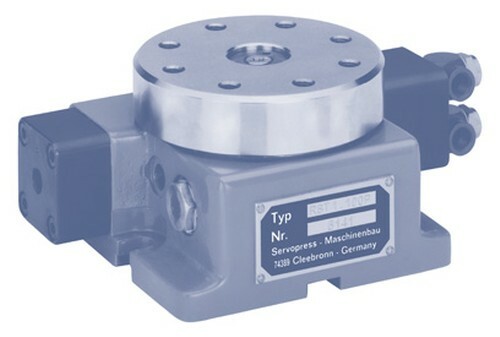 It has a built-in manual release knob for manual operation and a connection possibility for a remote release valve. The rotary indexing tables for their part, let out an end pulse "RST has divided" which can also be used for subsequent control of other units. 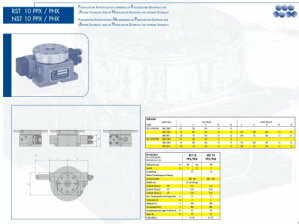 For larger gyrating masses it is possible to instigate the intermediate switching of a DW 1 type air-oil-actuator for PHX design pneumohydraulic drive. Ø 200 x 10 mm. The PPX / PHX can either be supplied with a table diameter of 100 mm or 160 mm. The basic and smallest built-in fractional pitch is 72. Whereby every numerical limit division can be adjusted. With the V-design (V= adjustable) this is achieved by simply putting a stop measure block sleeve on the cylinder screw thread bottom. With the F-design (F= fixed) setting is achieved by putting a respective stroke-arresting pin stop into the cylinder. Both designs avoid any cylinder dead space, thereby saving air. The appliance is locked down with spring washers. Whereupon the appliance remains locked down and ready for operation even when there is a depletion of air. The spring tension can be adjusted. The elevating Mini-RST 10 PPX from ServoPress distinguishes itself with its small size of 203 x 105 x 75 mm. It is used when there is low machining power, with enormously fast pulsatory times have to be switched on. Precision over a long serviceable life is achieved by interlocking with 2 rings of hardened precision balls. In this case the ball coupling is considerably better than other interlocking systems. Standard precision is Q 60 (± 60 angular seconds). This corresponds to ± 15µm error with a plate diameter of 100 mm. Special kinds of precision are available from ServoPress on request. The RST 10 PPX is pneumatically driven and absorbed. For more exacting requirements absorbing can be done hydraulically (PHX). NST 10 PPX has the same characteristics as RST though it is not elevating.